Head coach Peter Moores, who says Notts have had highs and lows this season but prefers to take the last 18 months as a whole package. 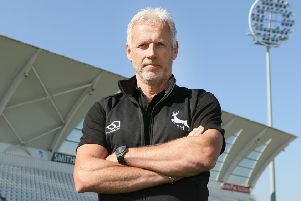 Head coach Peter Moores has admitted that Nottinghamshire must improve after a frustrating season in all competitions. But he feels that what the club have achieved in the last 18 months, which included a memorable 2017 campaign, should be looked at as “a whole package”. The season began well for Notts as they established themselves in the top flight of the Specsavers County Championship, after promotion. But they bowed tamely out of the Royal London One-Day Cup and then the T20 Blast, both of which they won last year, before only narrowly avoiding Championship relegation with four defeats in their last six games. Moores said: “We had a tough six weeks to finish the season. But our goal was to stay in Division One, and we’ve done that. “I prefer to look at the last 18 months as a whole package. In that time, we have won two trophies, had two quarter-finals, achieved promotion and stayed up, so we’re quite proud of what we’ve done. “There have been highs and lows this year, and we share the members’ frustrations at how things have gone at times. We have to learn lessons and be stronger next year. Our new signings will help. Those new signings include Ben Duckett, Joe Clarke, Ben Slater and Zak Chappell.